Azure IoT Hub is a fully managed service that helps enable reliable and secure bi-directional communications between millions of devices and a solution back end. Send telemetry from a device to an IoT hub... shows how to create an IoT hub, provision a device identity in it, and code a device app that sends device-to-cloud messages. From your solution back end, send cloud-to-device messages to a single device through IoT Hub. Receive cloud-to-device messages on a device. From your solution back end, request delivery acknowledgement (feedback) for messages sent to a device from IoT Hub. You can find more information on cloud-to-device messages in D2C and C2D Messaging with IoT Hub. At the end of this tutorial, you run two .NET console apps. SimulatedDevice, a modified version of the app created in Send telemetry from a device to an IoT hub..., which connects to your IoT hub and receives cloud-to-device messages. SendCloudToDevice, which sends a cloud-to-device message to the device app through IoT Hub, and then receives its delivery acknowledgement. 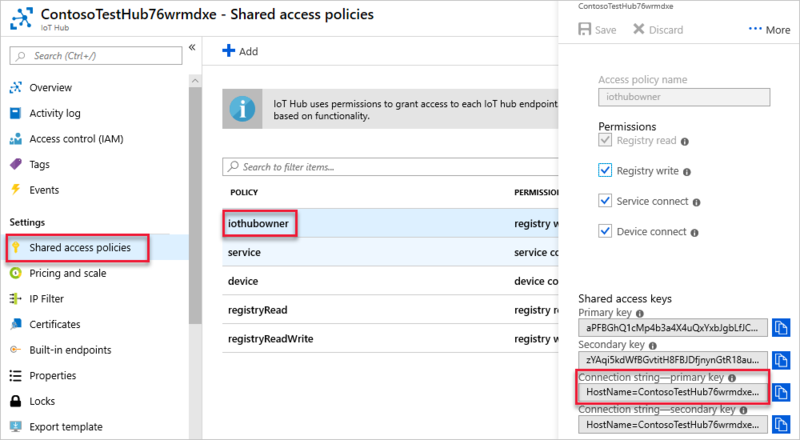 In this section, you'll modify the device app you created in Send telemetry from a device to an IoT hub... to receive cloud-to-device messages from the IoT hub. In Visual Studio, in the SimulatedDevice project, add the following method to the Program class. The ReceiveAsync method asynchronously returns the received message at the time that it is received by the device. It returns null after a specifiable timeout period (in this case, the default of one minute is used). When the app receives a null, it should continue to wait for new messages. This requirement is the reason for the if (receivedMessage == null) continue line. The call to CompleteAsync() notifies IoT Hub that the message has been successfully processed. The message can be safely removed from the device queue. If something happened that prevented the device app from completing the processing of the message, IoT Hub delivers it again. It is then important that message processing logic in the device app is idempotent, so that receiving the same message multiple times produces the same result. An application can also temporarily abandon a message, which results in IoT hub retaining the message in the queue for future consumption. Or the application can reject a message, which permanently removes the message from the queue. For more information about the cloud-to-device message lifecycle, see D2C and C2D messaging with IoT Hub. When using HTTPS instead of MQTT or AMQP as a transport, the ReceiveAsync method returns immediately. The supported pattern for cloud-to-device messages with HTTPS is intermittently connected devices that check for messages infrequently (less than every 25 minutes). Issuing more HTTPS receives results in IoT Hub throttling the requests. For more information about the differences between MQTT, AMQP and HTTPS support, and IoT Hub throttling, see D2C and C2D messaging with IoT Hub. First, retrieve the IoT Hub connection string from the portal. Sign in to the Azure portal, select Resource groups. Select the Resource group you are using for this how-to. Select the IoT Hub you are using. In the pane for the hub, select Shared access policies. Select iothubowner. It shows the connection strings on the iothubowner panel. Select the copy icon for the Connection string--primary key. Save the connection string for later use. Now you write a .NET console app that sends cloud-to-device messages to the device app. In the current Visual Studio solution, right-click on the solution and select Add > New Project. Select Windows Desktop and then Console App (.NET Framework). 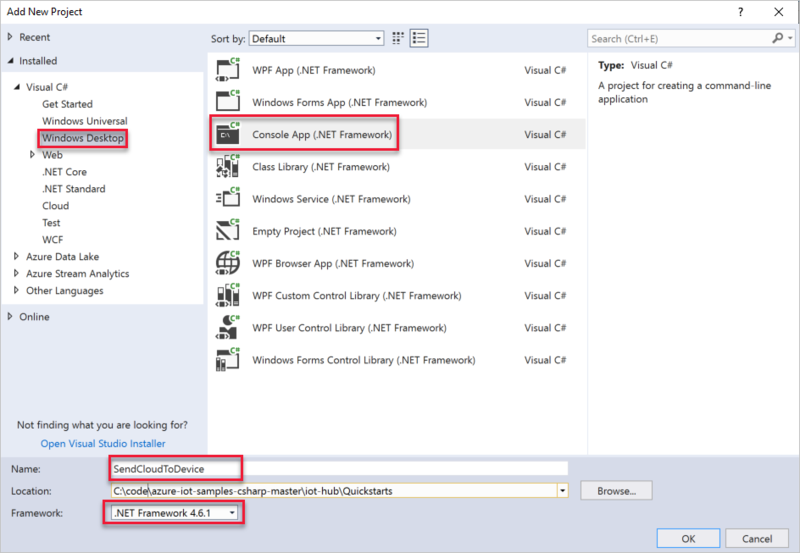 Name the project SendCloudToDevice and select the most recent version of the .NET Framework, then select OK to create the project. This action opens the Manage NuGet Packages window. This downloads, installs, and adds a reference to the Azure IoT service SDK NuGet package. Add the following using statement at the top of the Program.cs file. Add the following fields to the Program class. Substitute the placeholder value with the IoT hub connection string you saved previously in this section. Finally, add the following lines to the Main method. From within Visual Studio, right-click your solution, and select Set StartUp projects.... Select Multiple startup projects, then select the Start action for ReadDeviceToCloudMessages, SimulatedDevice, and SendCloudToDevice. Press F5. All three applications should start. Select the SendCloudToDevice windows, and press Enter. You should see the message being received by the device app. It is possible to request delivery (or expiration) acknowledgements from IoT Hub for each cloud-to-device message. This option enables the solution back end to easily inform retry or compensation logic. For more information about cloud-to-device feedback, see D2C and C2D Messaging with IoT Hub. In this section, you modify the SendCloudToDevice app to request feedback, and receive it from the IoT hub. In Visual Studio, in the SendCloudToDevice project, add the following method to the Program class. Note this receive pattern is the same one used to receive cloud-to-device messages from the device app. Add the following method in the Main method, right after the serviceClient = ServiceClient.CreateFromConnectionString(connectionString) line. To request feedback for the delivery of your cloud-to-device message, you have to specify a property in the SendCloudToDeviceMessageAsync method. Add the following line, right after the var commandMessage = new Message(...); line. Run the apps by pressing F5. You should see all three applications start. Select the SendCloudToDevice windows, and press Enter. You should see the message being received by the device app, and after a few seconds, the feedback message being received by your SendCloudToDevice application. For simplicity's sake, this tutorial does not implement any retry policy. In production code, you should implement retry policies (such as exponential backoff), as suggested in the article, Transient Fault Handling. In this how-to, you learned how to send and receive cloud-to-device messages. To see examples of complete end-to-end solutions that use IoT Hub, see Azure IoT Remote Monitoring solution accelerator. To learn more about developing solutions with IoT Hub, see the IoT Hub developer guide.